Warminster, PA (October 18, 2010) − OraPharma, Inc., a specialty oral health company dedicated to bringing scientifically and technologically advanced products to the dental community, including ARESTIN® (minocycline hydrochloride) Microspheres, 1 mg, will be rolling out the MyARESTIN.com® Mobile site, after unveiling it at the recent ADA Annual Session in Orlando. 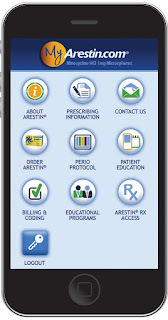 MyARESTIN.com® Mobile is a convenient and portable personal practice resource that is derived from the popular website www.MyARESTIN.com. Like its website namesake, the mobile website is designed to help the entire dental team, including dentists, hygienists, and office managers, provide the highest level of periodontal patient care possible via the latest information delivered to virtually any smartphone. For the latest periodontal disease treatment information customized for your practice, and to take advantage of the immediacy and convenience of MyARESTIN.com® Mobile, visit www.MyARESTIN.com with your browser-enabled mobile device. and root planing (SRP) procedures for reduction of pocket depth in patients with adult periodontitis. ARESTIN® may be used as part of a periodontal maintenance program which includes good oral hygiene, and scaling and root planing. The most common treatment-emergent adverse events were headache (9.0%), infection (7.6%), flu syndrome (5.0%), and pain (4.3%). These occurred at a similar rate to SRP and SRP + placebo. 1. Goodson JM, Gunsolley JC, Grossi SG, et al. Minocycline HCl microspheres reduce red-complex bacteria in periodontal disease therapy. J Periodontol. 2007;78 (8):1568-1579. 2. Electronic survey, sponsored by OraPharma, Inc., of 62 dentists and registered dental hygienists attending the RDH Under One Roof Convention (Orlando, August 2010) and the American Dental Hygienists’ Association Annual Session (Las Vegas, June 2010). OraPharma, Inc. is a specialty pharmaceutical company that discovers, develops, and commercializes therapeutics for the treatment of periodontal disease at various phases of progression. ARESTIN® (minocycline hydrochloride) Microspheres, 1 mg (www.arestin.com) is indicated as an adjunct to scaling and root planing procedures for reduction of pocket depth in patients with adult periodontitis. For more information about OraPharma, Inc. and its products, visit www.orapharma.com. 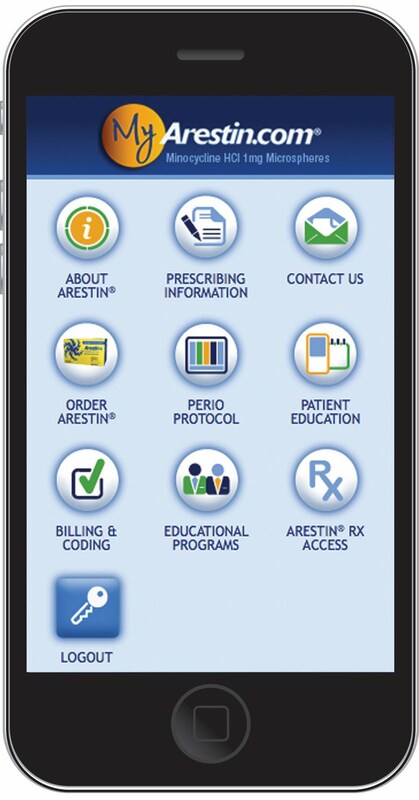 ARESTIN® is a registered trademark of OraPharma, Inc.